I went into the museum last Friday just to draw. I had a little extra time this week to indulge. When I arrived it was swarming with school groups. Initially I had wanted to just spend the day doing quick studies of various ungulates, but it was too crowded and so I headed up to zoology to pull something from the bird collections from which to work. 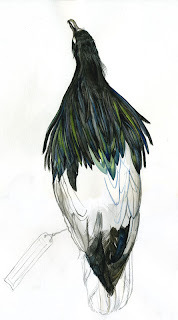 I chose a Nicobar Island Pigeon. I wasn't familiar with them until doing a bit of reading up on Dodos. While they are not flightless like the Dodo, they are supposedly very distantly related to Dodos. They inhabit the Nicorbar Islands and other Indonesian Islands. They're rather large and have beautiful mantles of long, thin, blue-green, and rust colored feathers. As you can see I did not complete the watercolor and hope to do so this week. The specimen I was working from was from the 1960s. The feathers are dreamy...can't wait to see it finished.